An excellent resource for any visitor to Glacier National Park, focusing on day hikes. 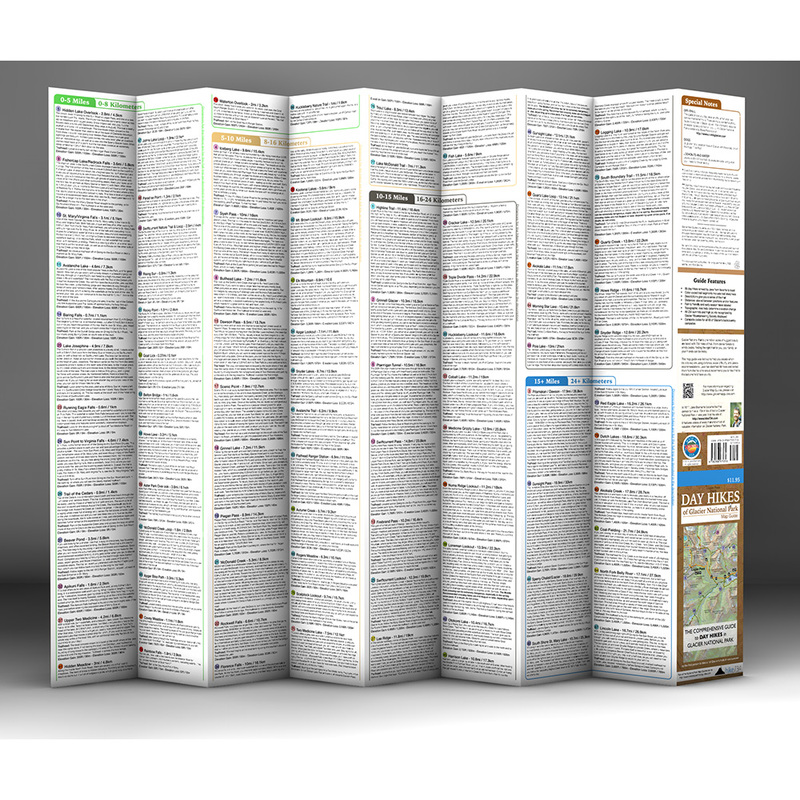 This helpful tool will assist you in selecting just the right hike for you and yours. Thanks, Jake! I LOVE this trail guide. 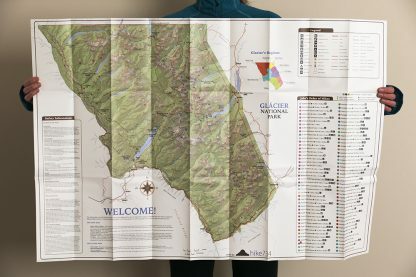 Not only is it an awesome map – WAY better than the park service handout, it also has SO much useful information in one handy place. Like, did you know there is a side trail off the Highline where you can look over the Garden Wall into the Many Glacier Area and see Grinnell Glacier from above?? I can’t wait to do this hike when I’m there this summer. Thank you for such a wonderful planning tool! Love this guide! My husband had watched Jake’s hikes on YouTube about a 100 times, so we knew we wanted the map! Information is concise and informative! The material it is made of repels water, so you can wipe it off if it gets wet! We love Glacier and are tracking the dates we complete the hikes on this map! It is very special to us and we know it will last forever!!! If you do not have this map and you are visiting Glacier we highly suggest purchasing it! A must have “get before you go” planning tool. 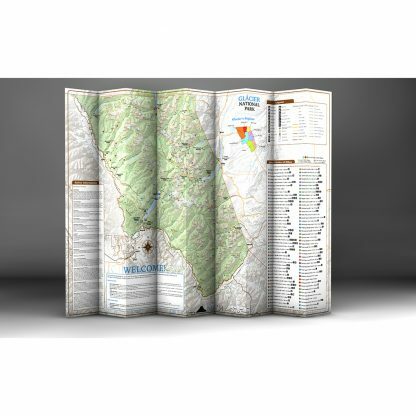 A high quality topo map that lays out the geographical location of the trail heads with all the trail information. This map really makes planning your trip an enjoyable experience. This is a great map. 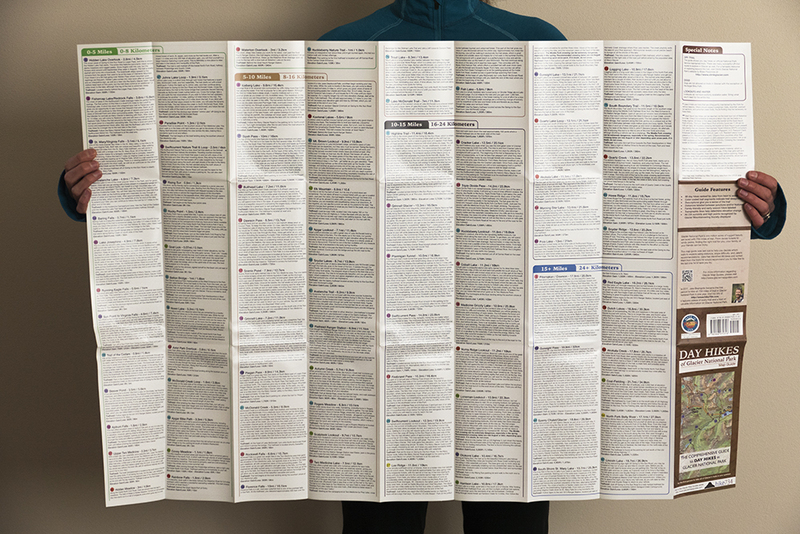 I love all the information on the back – descriptions, elevation changes, distances, what you can expect to see. Another great resource of information. Why guess if the trail is right for you when you have this handy map. Along with the videos you can cover even the hardest trails. Great map and guide for Glacier get always. Love that the trails are rated. I’ve given this to each of my children. This map/guide is a must when planning your GNP trip! Only working issue is that a few mileage notations are blocked by other icons. Love this map. Everything we need! Thank you so much!!! I LOVE Jake’s guide! It is accurate and has great information on it. Thanks, Jake! This is a great map. Bought it last year and used it to hike several trails. I have had it out several times this winter planning my summer hikes. A durable and great guide. I had this on my last trip to Glacier and Jake’s unique insight really enhanced the trip. Also his YouTube videos are great(You will never wonder what bird you are seeing in the park cause Jakes seen em all ). I bought this map when if first came out in preparation for my families 10 day trip to Glacier. I love it. It is packed with information. Jake tells it like it is and it was great to see an honest opinion about the hikes. I use it now as a wall hanging in my office that I will look at to remember my trip and plan my next one. A must have map if you are heading to Glacier! I am thoroughly impressed. This map is detailed (just as good, if not better than NatGeo), easy to read, and durable. I can’t stop pouring over it while planning my trip. Thanks! Just received my map and I must say this is map was generated with the hiker in mind. No guessing how far or how steep–this map has trails color-coded by steepness, as well as distances labeled. The added trail descriptions are a nice touch. Although I have many maps of Glacier NP, this is now the ‘go-to’ map for trip planning. 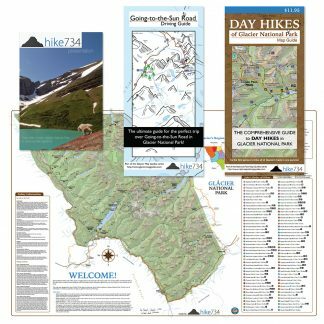 If you are looking for a great map for day hikes or backcountry trips–consider this one. Great resource for finding hikes to do. We used it extensively! 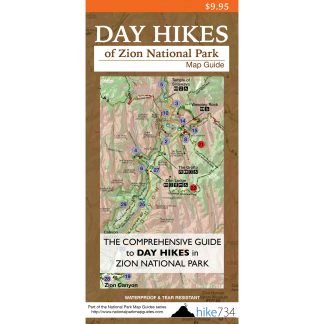 Describes each hike in distance, elevation gain, what you will/might see, and how to find the trailhead. Don’t do Glacier without it! A thoughtful presentation of the many hikes available in Glacier Park. Jake’s unique approach to map making clearly outlines features of interest to anyone looking to explore Glacier. Particular attention is paid to best match hikers with hikes so that expectations and abilities are in sync. An excellent resource – highly recommended. 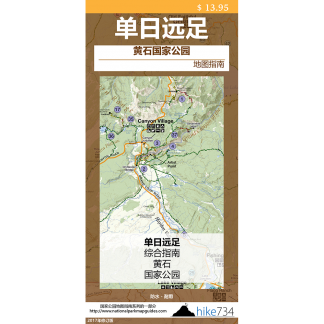 Loved this guide- good details about the hikes. Really like the elevation gain! We used this guide exclusively when we traveled to Glacier last year(August 2015). We bought the Going to Sun Road guide as well. 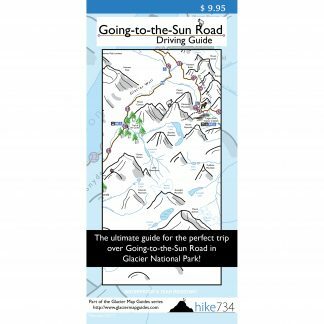 The guide gives distance, elevation gains and ratings so that you can make an educated decision about whether the hikes are within your limitationsThis year we are headed to Yellowstone and have already purchased the Yellowstone Guide. I picked up My Gal ,2014 ,in Billings to do Glacier National Park . Yellowstone , and Rocky Mountain National Park ,too …. They turned out to be a “No Brainer” a GREAT FIND , Jake has done what all of us would love to have the time to do ?, and Has Done it RIGHT ? If You want to know what’s going on , Where and how , He’s got The Map …. Great ratings , and Evaluations of every trail . We found no other maps that even come close . As we love to do in anticipation of returning to our Favorite National Park , Glacier , even a little like the Map Master , We Married after the first visit to Glacier , and as he always says , the trail awaits, Even if Your in Your 60s , Grab his Map And ENJOY .? I always check Jake’s guide to Glacier before hiking. It is full of useable, accurate information. I recommend it for planning your adventures on Glacier! I highly recommend you pick up Jake’s maps before your head out on your next hike! They are an indispensable resource for making the most of your time and adventure! Great Map! Jake is really good with getting back to you if you have questions on anything in the park! Placed my order late Thursday night and received the map on Monday (on the east coast), super fast response time. Thanks Jake! This is really helping us plan our first trip to GNP. Can’t wait to step out on the trail. We are planning a return to Glacier NP for the first time in 20 years. This time we’re looking for day hikes… I couldn’t be more pleased with this map, especially when compared to the map and guidebook we bought 20 years ago. Very easy to find hikes that look perfect for us! Glacier is my favorite place in this world and Jake’s guide just keeps enhancing my experiences there! I love to explore new areas and thee is no better way to do so than with Jake’s guide. I find a nice base camp and use this guide to plan my daily hikes. I like the way they are broken down by location, distance and difficulty which enables me to maximize each day. I know if I do a long strenuous hike one day then I can follow it up the next day with one or two easy ones. My goal is to eventually be like Jake and hike every trail, although not in one summer 😉 I’ve been using a yellow highlighter to mark the hikes I’ve done on Jake’s Order of Hikes, and so far I’ve done half of the the top 20. I need to get to Glacier more often! If you are planning on Day Hiking in Glacier then this is will be the best investment you can make. My husband and I visited Glacier National Park in both 2016 and 2017. 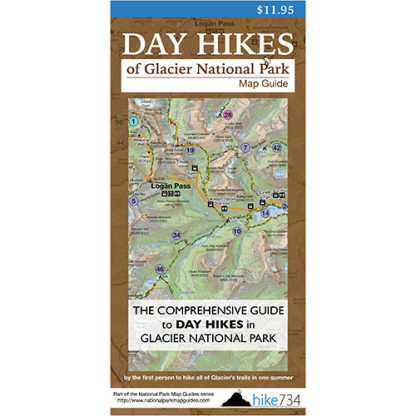 I had ordered the Day Hikes map guide on GNP and it was absolutely the best resource for planning our visit. We are in our 60’s and have recently taken up hiking in various locations and I wish Jake would do more guides in the US ! I also have recently ordered the guide maps for Yellowstone, the Grand Tetons and Zion National Park which we will be visiting the next couple of years. The product is very thorough and we can easily plan the hikes, knowing what to expect and helping us plan the best hike for what we will accomplish each day. The durability of the product is remarkable, having lasted through 2 separate vacations. Thanks, Jake for such a great product. This is the only hiking resource you need for Glacier NP. I’ve always lugged a falcon guide around with me but the maps were never very accurate and it was hard to get a sense of where things were. Once I found Jake’s map I haven’t used any other guidebook. His descriptions of hikes are dead on and the back side of the map breaking them down by distance is incredibly helpful for planning a few days worth of hikes. But the real star here is the color coded elevation gain. Wow, I wish every map had this! Yes, I can read topo maps but this is just so effortless. I like studying the map and knowing exactly how many real lung busters are in my future. Is it a slow upward slog the whole day or is it short bursts of effort? With a quick glance I know. And while I’m primarily a dayhiker this map has shown me how many great backcountry sites there are and backpacking in Glacier is on my short term goal list. For such a low price it would be silly not to get one. I’ve actually started giving them as gifts to fellow hikers. And I find myself wanting to explore more parks that Jake has made maps of just because I want to make use of all of them. 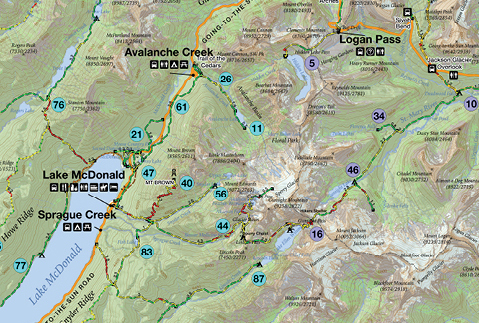 This by far, is the best hiking reference map of Glacier. Well made, waterproof and easy to follow. I wish it came in a smaller size also to hang on my wall, because it’s just a work of art! Thank you Jake for all your inspiring videos and maps! To plan your hikes, Jake’s maps are the first ones to buy and likely the only maps you will need. Very well constructed, as well.